I had a request by Jennifer to find the tank below that Keri Hilson is rocking in her Knock You Down video. See the blurry captures below. This search was actually much easier to locate. Phew! 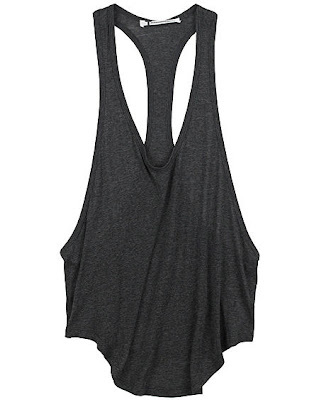 It just so happens to be the T by Alexander Wang Baggy Athletic Tank. This is a classic and I've posted several images below with price points from a couple of sites. I could not locate the Baggy Athletic Tank in white so I posted the above classic pocket tank just in case you were set on a white tank. Thanks again for the request Jen! I love the baggy athletic tank for this summer, and needless to say Keri Hilson does it well. But, I'm dying to know more about the accessory she wears over it. In the knock you down video she wears a chain/necklace over her upper body, what is it called? I've seen them in chain and leather, and I'd love to get my hands on one. Thanks.